Kansas City Chiefs quarterback Matt Cassel (7) celebrates his touchdown pass to tackle Mike Vrabel (50) during the first half of an NFL football game between the Dallas Cowboys and Kansas City Chiefs Sunday, Oct. 11, 2009, in Kansas City, Mo. Kansas City Chiefs tight end Sean Ryan (89) also celebrates on the play. OK, so what is this headline all about? 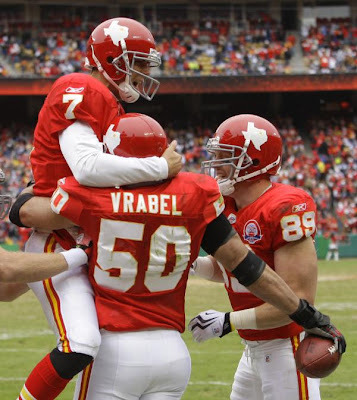 It's Mike Vrabel's touchdown reception in the Kansas City Chiefs 26-20 loss to the Dallas Cowboys yesterday. It marked the 9th regular season score for the "tight end" whose primary position happens to be on the other side of the ball. He also has two postseason scores. For players whose primary position is on defense, no one is even close to Vrabel in terms of offensive production. Remember William 'The Fridge' Perry? He famously scored a rushing touchdown in the Bears '85 Super Bowl and Walter Payton did not. He has three career touchdowns. Deion Sanders got in on the offensive act scoring three touchdowns in his career. But those two combined, both tied for second place, don't match Vrabel's total touchdowns. He stepped into Sunday's game and was announced as an eligible receiver. Play one was a handoff to Larry Johnson. Play two, Vrabel lined up as the left tight end and simply broke free for a score on a little out pattern. Easy enough. After the game, we asked Glenn Dorsey if he knew that Vrabel had such great hands. "Oh yeah," Dorsey responded, "I see it everyday in practice. He's a tremendous player. And he's a leader for us so I'm not surprised he made a tremendous play." Everyday in practice? You would think a gimmicky play like that wouldn't work so many times but apparently it does. Vrabel's career high is three touchdowns in one season. He's on pace pace for 3+ this season and, judging by Dorsey's comments, there could be more coming.